Home / Everest Staff / Congratulations Fr. Daniel! Fr. Daniel finished not only his time here at Everest but also the New York City Marathon! After the Mass, the students, faculty, and staff presented Father with some parting gifts including a spiritual bouquet, a photo book, a special Mountaineers running shirt, and a new sign to be placed at the head of the cross country trail naming it Via Veritatis, in honor of Father’s legacy of constant pursuit of truth and guidance to discover and live by it. On Sunday, November 4, Fr. Daniel pursued his goal of running the New York City Marathon, completing the race in 3:09:21, his personal record! 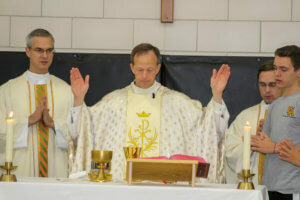 Congratulations Father Daniel! 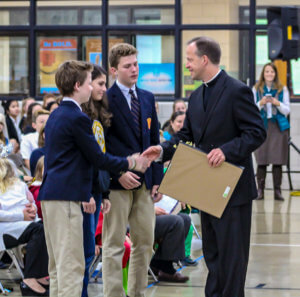 Father offered to pray for the Everest community during his run, and began an initiative of 26 Days of Giving for this year’s annual fund drive campaign. Click here to download a pledge card or donate online today! 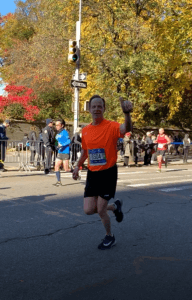 “In the spirit of St Paul who said: “I have finished the race; I have kept the faith” (2 Timothy 4:7) my plan is to run the New York City Marathon in November in honor of all of you who make up this community of faith known as Everest. I will offer each mile of the marathon for a specific intention, and it is my hope that as a community, we can use this opportunity to raise funds for Everest.